· (Longer flight time): This selfie drone comes with 2 powerful 3.7V and 250mAh batteries, support a longer flight time of up to 14 minutes. That could give you more fun. · (APP Control System): With the live video camera, operate your HD camera drone via an APP after connecting the Wi-Fi to your phone (iOS or Android), offering you real-time image streaming, easy to take and read, fun to share. · (Altitude Hold): When you release the throttle and the folding drone they will lock at a certain height, making controlling the mini rc drone much easier. You could take more stable and clearer images. Very suitable for beginners, children and amateurs. 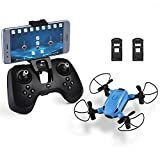 · (One key to take off and land): The mini folding drone is equipped with a key to take off and land, which makes the drone easier to fly and better control it for any level of players, so you don´t have to worry about losing it when flying. It is also an ideal outdoor toy.